40 • April 2018 • S I G N & D I G I T A L G R A P H I C S DIGITAL PRINTING AND FINISHING DIGITAL GRAPHICS Bokeh Effect In looking at the Filter Gallery you're probably wondering what the Bokeh effect is. Briefly explained, bokeh is simply the effect created when the camera lens renders out-of-focus points of light. 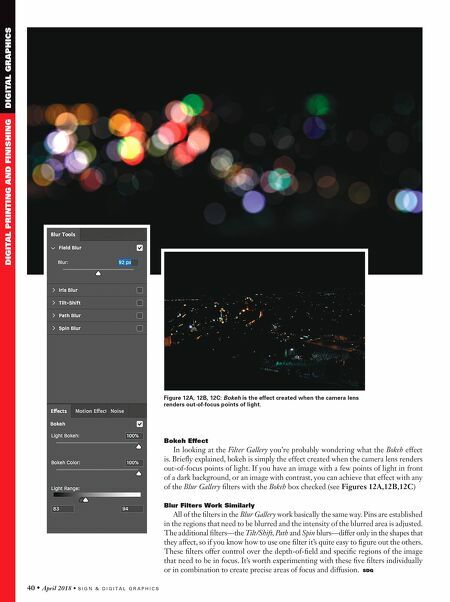 If you have an image with a few points of light in front of a dark background, or an image with contrast, you can achieve that effect with any of the Blur Gallery filters with the Bokeh box checked (see Figures 12A,12B,12C) Blur Filters Work Similarly All of the filters in the Blur Gallery work basically the same way. Pins are established in the regions that need to be blurred and the intensity of the blurred area is adjusted. The additional filters—the Tilt/Shift, Path and Spin blurs—differ only in the shapes that they affect, so if you know how to use one filter it's quite easy to figure out the others. These filters offer control over the depth-of-field and specific regions of the image that need to be in focus. It's worth experimenting with these five filters individually or in combination to create precise areas of focus and diffusion. SDG Figure 12A, 12B, 12C: Bokeh is the effect created when the camera lens renders out-of-focus points of light.